"Checklist for Life is the ultimate handbook for living a successful, joy-filled life. 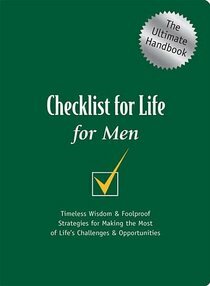 This follow-up title, "Checklist for Life for Men, offers insight into topics and issues that are specific to men's interests. In addition to a brief narrative, each interactive chapter of the handbook contains: An ?I Will? checklist of heart and attitude reinforcements.A ?Things to Do? checklist of action points.A "Things to Remember? section of Scripture verses and applicable quotes from famous and not-so-famous people.Topics addressed include work, integrity, and marriage. In all, the book addresses 66 topics men care about. And the handsome, sturdy package and two-color text design make "Checklist for Life for Men an ideal gift. About "For Men (Checklist For Life Series)"
A "Things to Remember" section of Scripture verses and applicable quotes from famous and not-so-famous people. Topics addressed include everyday miracles, prayer, purpose, and relationships. Unavailable. We are unsure when this item will be available to ship. eBook is Available. 0 Available.